It is also not a good sign that the labor participation rate has fallen 6% the past five years. 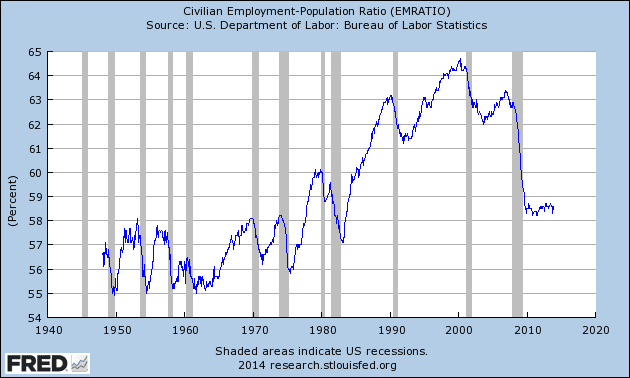 An easy way to understand this is that the unemployment rate really is about 6% higher than reported. Scroll through "Most Important Charts of 2013" on Business Insider for an easy way to see what is going on in the world of economics and finance. Among the things the charts make easy to see is that the Fed has clearly had a very material impact on the stock market inflation of assets. The following chart I made on the St. Louis Fed website shows the rebound in the stock market since the financial crisis and the unprecedented growth in the Fed balance sheet. 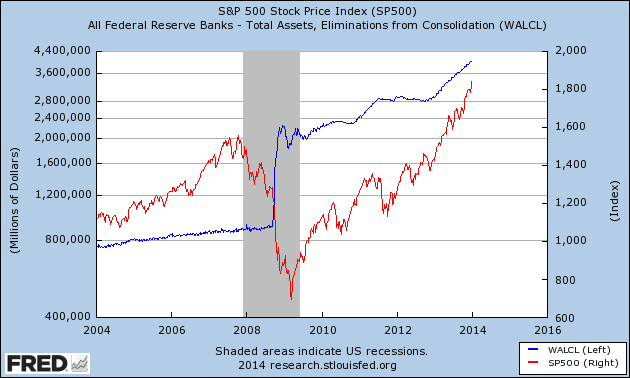 What happens if the Federal Reserve does in fact continue to cut back on its asset purchases? I discussed this on MarketWatch in an article about the issues that incoming Fed Chair Janet Yellen would face. The Fed is going to have to be nearly perfect in maintaining a balance that promotes economic growth without causing inflation. Participating in the upside of the markets while deflation and inflation seem to be balanced on a tight rope is what most people are looking for. Investors by and large do not understand the risks that are creeping towards us. Most only see and hear that the markets are going up and they do not want to "miss it." While I am not convinced we have any major asset bubbles that are easy to identify, there are massive risks to global economics, some of which that are hidden in plain sight that concern me greatly. George Soros recently wrote an editorial that summed up many of my concerns. As I discussed at The American Resource Boom Letter, China's complex situation makes if unlikely they will be able to lead a higher growth world. Barron's warned earlier in 2013 about "China's Looming Credit Crisis" just as Jim Chanos has been doing for several years. Japan is doomed in my opinion and I will cover that on MarketWatch soon. In short, with a national debt as bad as Greece's and few resources to fall back on, ultimately Japan will have a Greece moment. As a proud people, things could get very ugly there at some point before they ask for help. Already we see senior citizen suicides rising. Europe looks like it will move sideways for a very long time. France recently reported economic numbers that demonstrate that there is reason for concern in that large economy. Germany, due to ideological reasons, has been unwilling to do what it takes to once and for all slash debts in order to bring back growth and higher standards of living. Spain is in big trouble. Italy is questionable at best. What is not in plain site is the mountain of financial derivatives sloshing back and forth between parties. There is between 10x and 25x more bets on the world economy than there is world economy. It's not risk management that is going on. There is speculation upon speculation upon speculation, so many so, that we do not have any idea really how many. When the next recession comes, if it happens by shock, which is quite likely, that mountain could collapse. Here are a few charts from Crestmont Research to help demonstrate where the stock market is right now. From this we can see in the chart above, the secular (long-term) period we are in now is actually relatively normal in length and could very well last several more years. 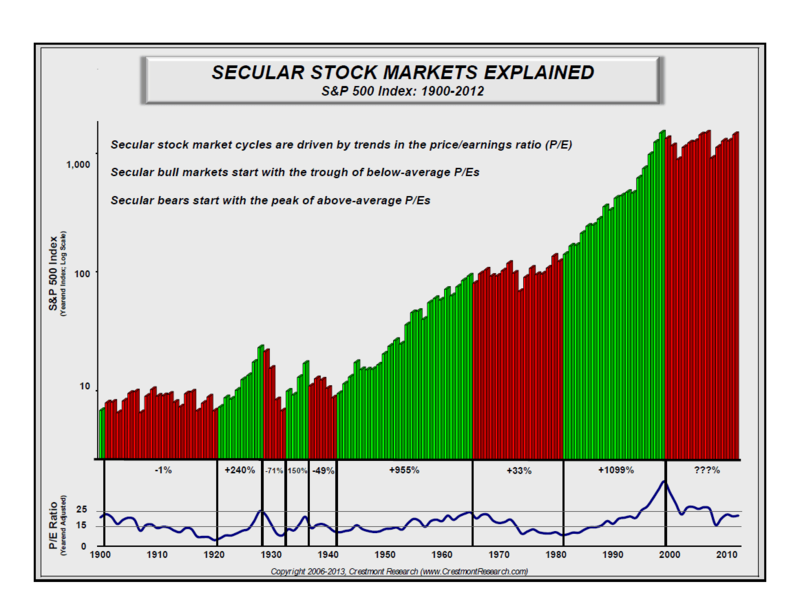 From Crestmont: "The preceding secular bull ended with the market valuation (P/E) at levels twice as high as all previous secular bulls. That meant that this secular bear had twice as much ground to cover. The last twelve and a half years have deflated the bubble, but the market still remains at levels consistent with secular bear starts." What else can be taken from the chart on the right is that maybe, just maybe, the combination of experimental policies by the Fed and U.S. Government have been successful. That is a possibility. It's also possible we have another significant leg down in the stock markets. Until something bad happens, it is very likely we do indeed see continued slow growth in the American economy because the banks have improved, corporations are solid for the most part and our natural resources, energy in particular which I have talked about a lot the past few years, really are a game changer. Until a recessionary wind hits, there will probably be no terrible stock market events - though a correction seems likely. Because the markets have generally moved in line with the above outlook, in our tactical ETF asset allocations, which are quantitatively based (very mathy), we have been mostly long the market throughout 2013, though in varying degrees. Most investors made gains in line with a globally balanced approach. In short, when money is being treated well, we allow our boat to rise with the tide. Should markets become more dangerous, we will anchor as fast as we can. This approach allows us to participate in most of the upside without accepting all of the downside. This method is easier said than done of course which is why I work with several of America's leading money managers, whom I monitor on an ongoing basis. To date, I have found three who meet all of my criteria, one in particular who is excellent for retirement accounts. In stock and option portfolios, I have carried high cash positions on and off. I sold much of our large Apple stock position on December 31st for a nifty gain after having bought the stock around $400 per share. I will take a new long position in Apple soon, likely using options as I believe the stock is destined to hit $1000 in the next few years. Our biggest winner of 2013 was SunEdison and I continue to be long this leading solar company. I have pulled back on oil and oil/gas service stocks, though continue to be long Chesapeake Energy which I believe has the potential to reach middle to upper double digit prices by decade end. I will buy back into our favorite energy companies soon as they work though a cycle of slight over valuation. We continue to own longtime holding Exact Sciences which has its FDA review this spring for their colorectal cancer screening test. Barron's suggested the stock would reach the $20s this year. I believe over the next few years that could just be a starting point as I expect the Exact test to dominate its market. For select portfolios that can accept the risk, I am betting against the Japanese Yen again which seems like a lay up given the Japanese government has told us they are going to continue devaluing the Yen. I discuss our Yen trade in this article. For a broader summary of companies we are or are likely to be invested in during 2014, see the MarketWatch January Trading Strategies Section. As always, keep in mind risks. The market does not care about your goals or you. Hard money is dangerous money. Right now, a lot of the market is hard money. There are very few easy opportunities. It may take a stock market correction that brings everything (correlated) down a double digit percentage for there to be less risky opportunities. While I am more concerned about mounting global financial risks again, I just want to reiterate that the United States sits, and frankly all of North America sits, in a very good comparative position. If we set ideology aside and focus on improving standard of living for everybody willing to work for it, the American Dream will continue. I have great hope for my kids and all the young people out there. My son has started college and seems to be adjusting well, even if he struggles like most young adults to prioritize well all the time. My daughter is a teenager and of course that comes with some challenges, but she is remarkable when motivated. I am also pretty impressed with most of the people in their age group, even if their thumbs seem to be attached to their cell phones. If America does fall apart it won't be the younger people's fault. Let's make sure us "old-timers" don't ruin it. I talk about what we can do to lead America on the Boomers Rock radio show I guest on - listen in sometime. Happy New Year and start thinking about what to plant in your garden. Even if you don't have a garden, I will update you on mine a time or two this year again with my "crop reports." This year I am taking another step in my quest to be a gentleman farmer with an improved method of starting my seeds.